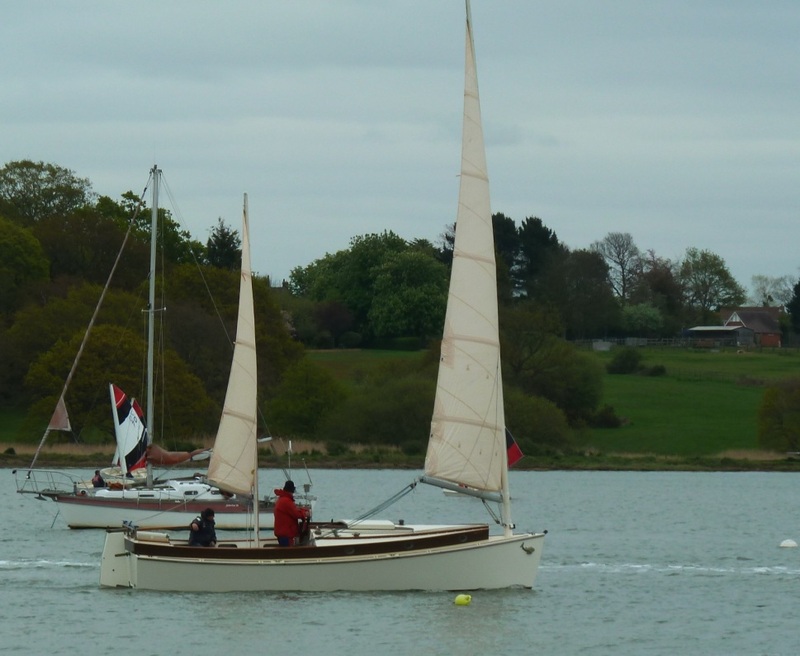 Not a boat you might ordinarily associate with the choppy waters of the Solent, this looks like a Norwalk Island Sharpie which are a range of modern, ultra shallow draft yachts designed by Bruce Kirby and inspired by American east coast working craft. Mr Kirby is perhaps more familiar as the designer of the Laser dinghy. 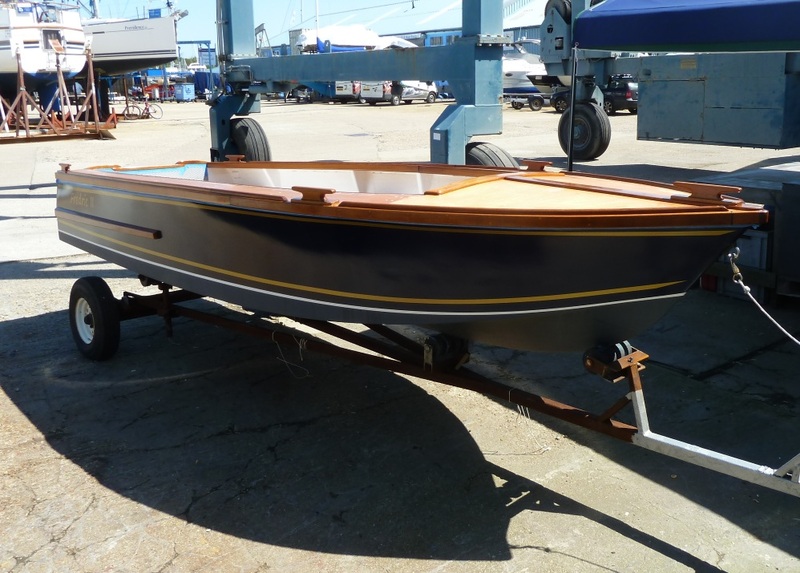 Although shallow draft, these boats which appear popular in Australia have made some impressive voyages and have an enviable reputation for sea keeping as well as speed. 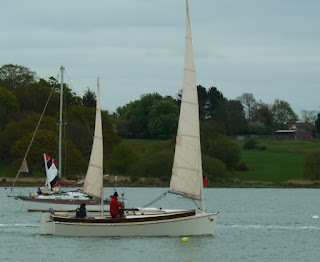 While a rarity on the Hamble as a cruiser for the Solent this boat makes a lot of sense, the unstayed masts should be quick and easy to rig at launch time, in any yacht fast is fun, plus speed means a wider cruising range whether for day sailing, a weekend away or the summer holiday. 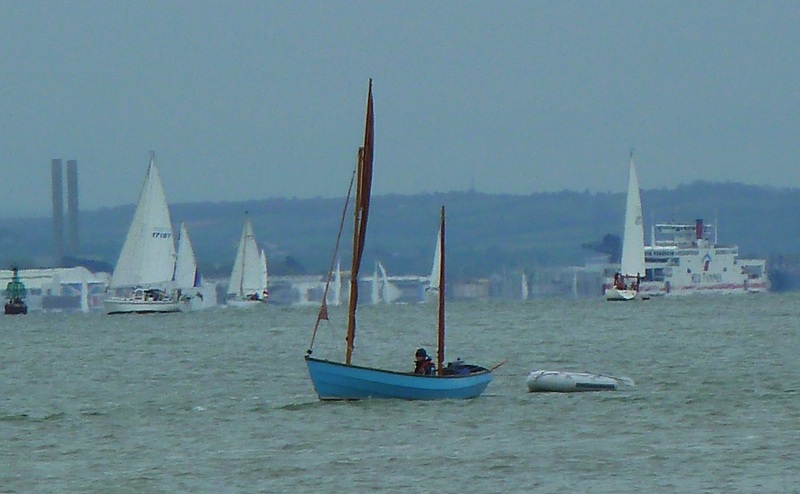 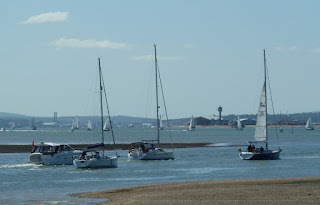 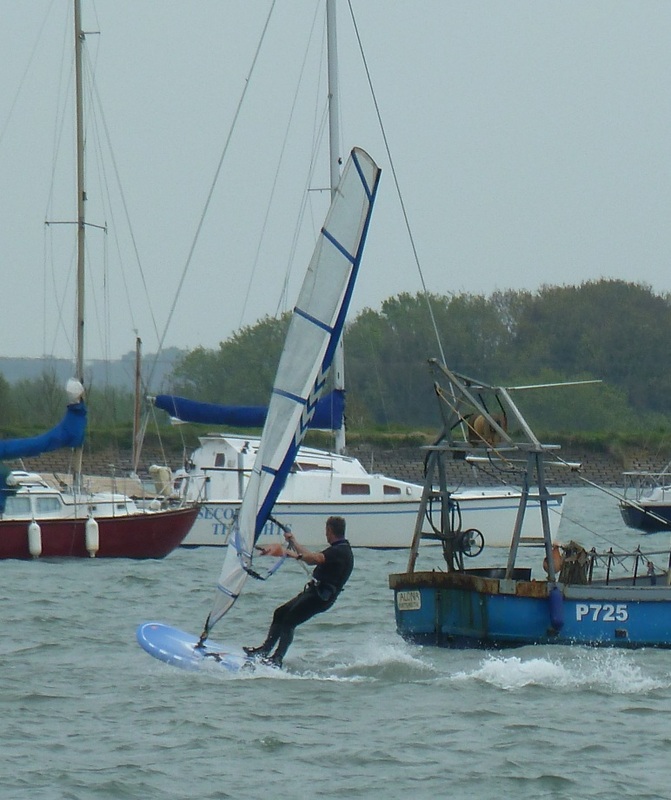 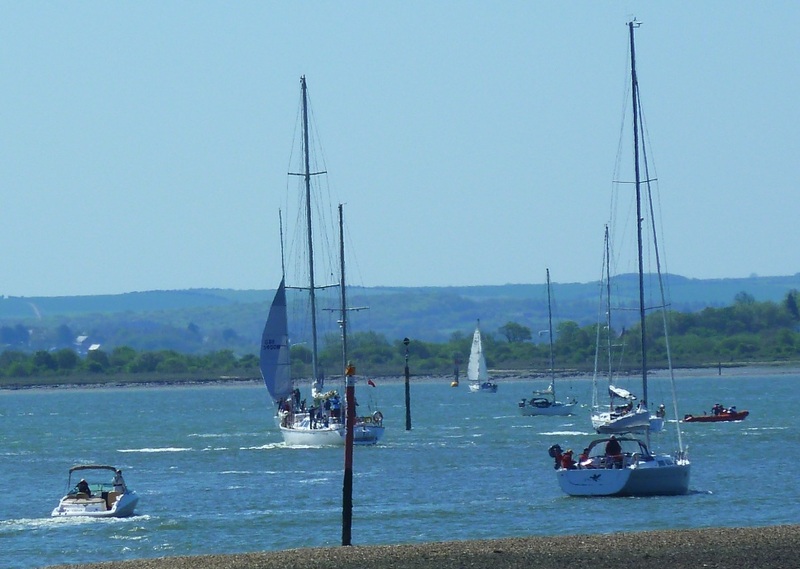 What I especially like is the shoal draft, imagine being able to sail in all that shallow water where the crowds don't go - Keyhaven, Priory Bay, all the out of the way places in Chichester harbour, lovely. 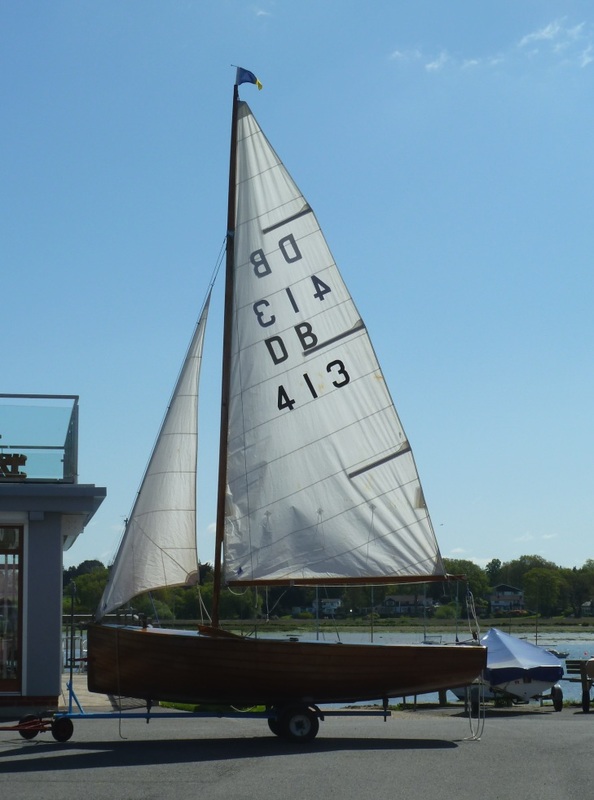 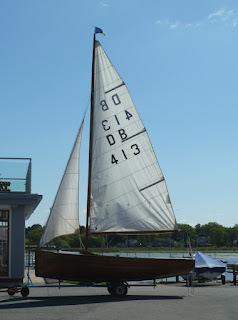 I've long been fascinated by sharpies and the Norwalk Island boats in particular, I'd love to have a sail in one, so if the owners are reading I'll be the one who stops buy in a black rowing skiff to ask you all about your boat - or of course you could always email me here! 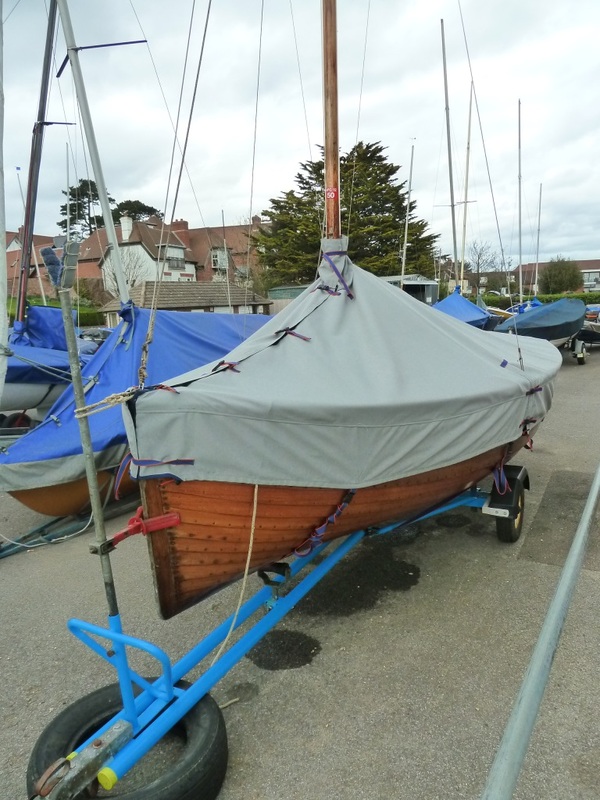 A couple of months ago I spotted this varnished clinker dinghy peeking out from under it's cover down in the Hamble boat park, it was clear from those fine bow sections and the wide transom that it was something interesting but what? 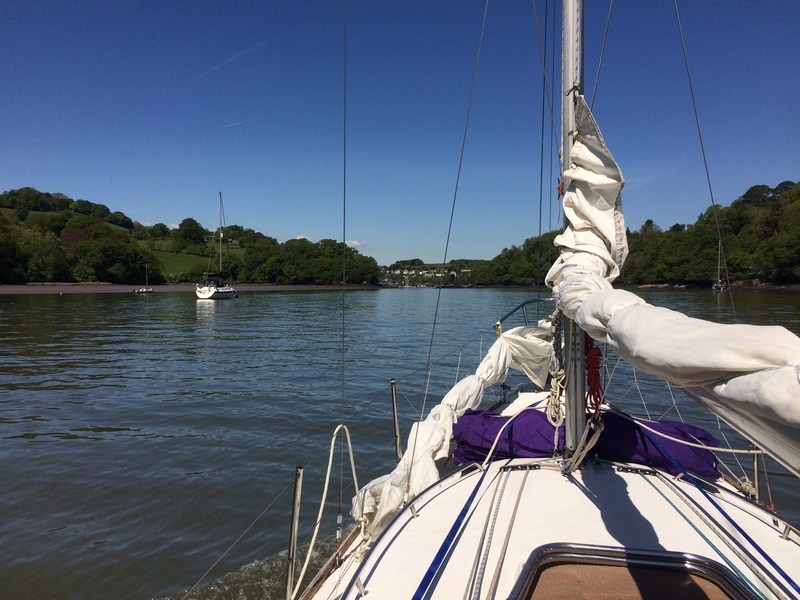 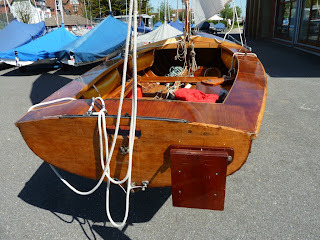 The answer was revealed on a gloriously sunny Saturday morning, she is a Yachting World Day Boat, rigged and ready for the water. 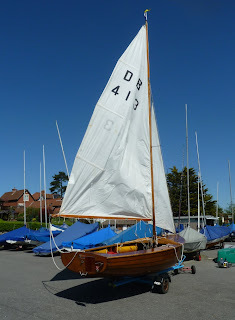 Sadly the owners were not around to speak with so I had to satisfy myself with a few photographs. 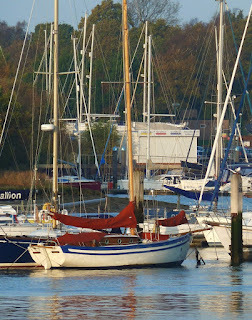 A quick look on the YWBD association suggests she is Fiesta built by L H Walker of Leigh on Sea in 1965, judging by her decks and interior she has been well cared for over the year - lovely! 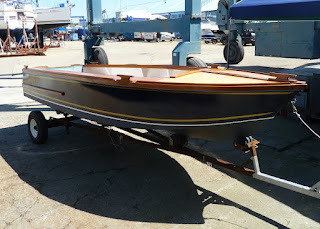 The Yachting World Dayboat was designed in 1949 by G O'Brien Kennedy, M.R.I.N.A. 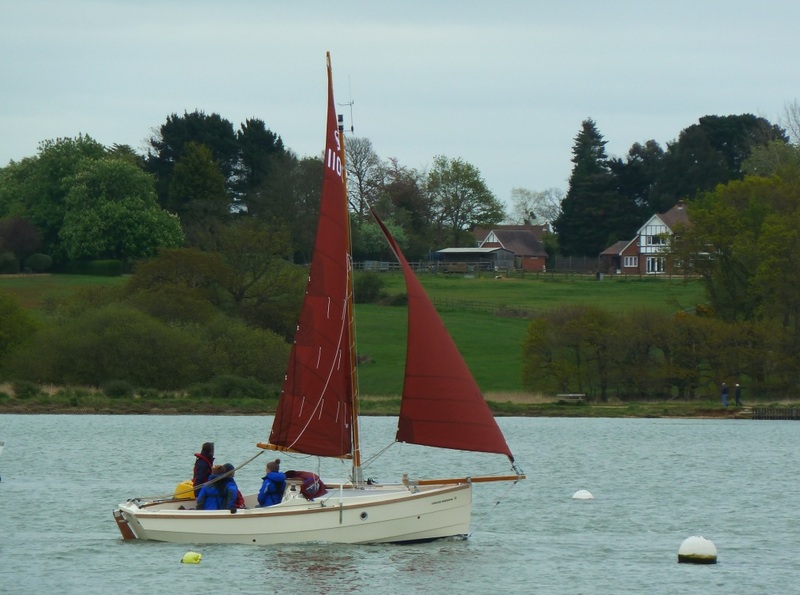 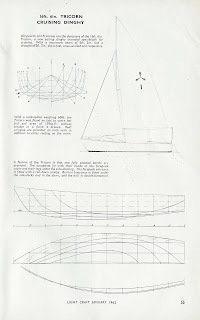 His brief was to submit a design to "Yachting World" for a robust, round-bilged dinghy which could be used for family sailing and was capable of standing up to some of the more difficult open waters encountered around our coasts. 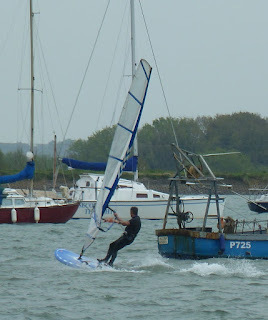 It had to have a generous freeboard and plenty of stability. 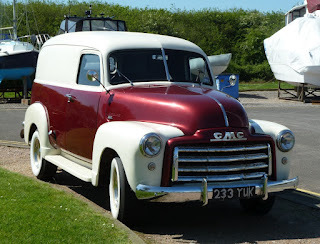 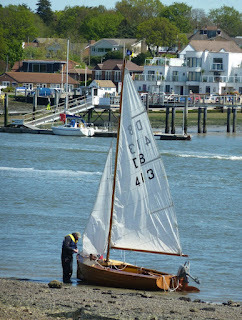 A little later we saw her drawn up on the foreshore at Hamble Point, presumably for some small adjustment. 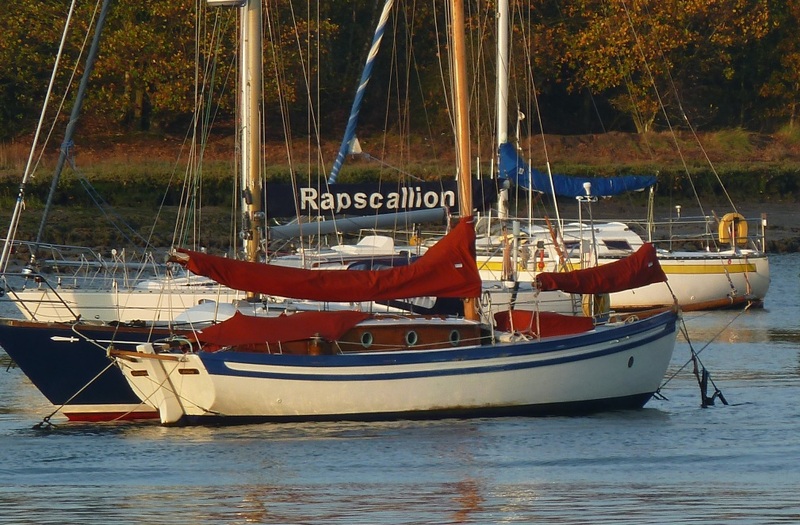 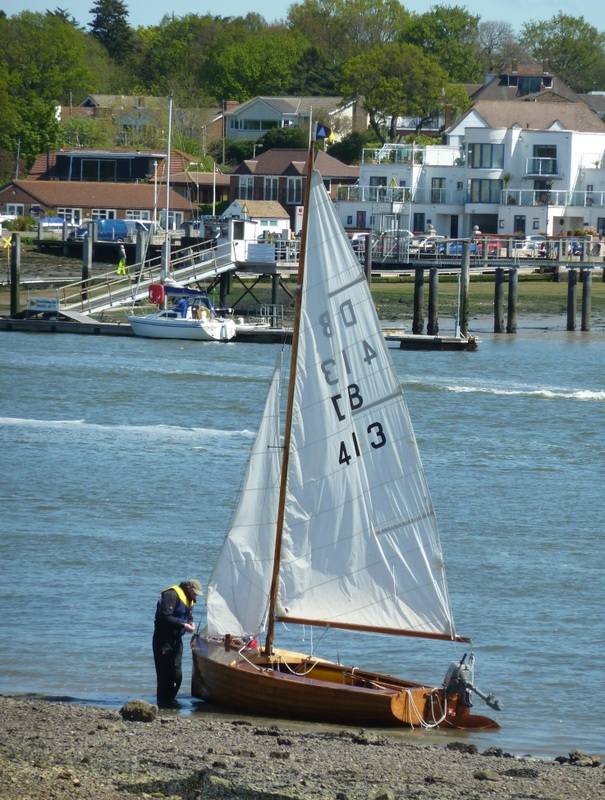 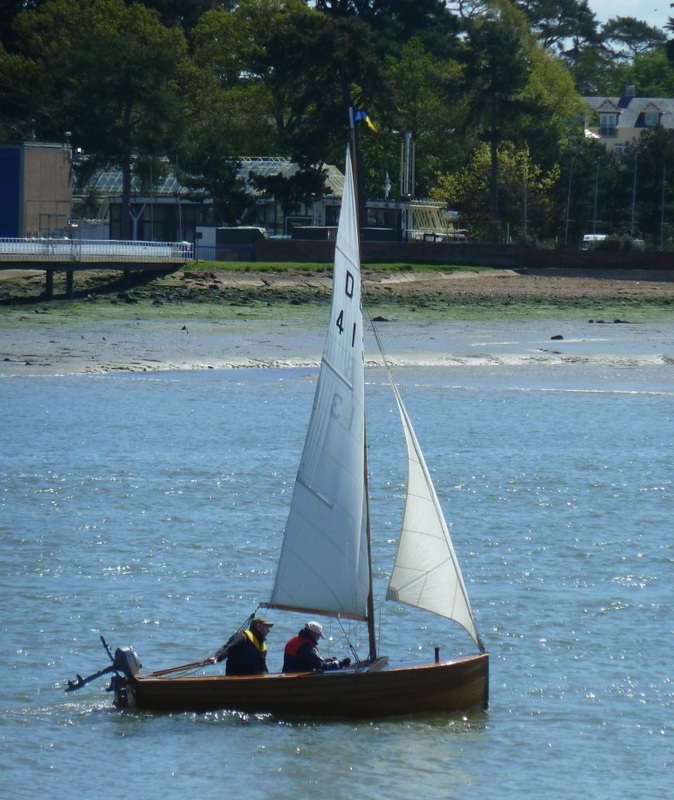 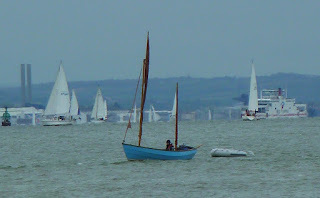 She was soon sailing again heading out past the Warsash shore, looking fabulous. A varnished wooden boat on a sparking sea does it get any better? From time to time I think about getting a motor boat, a handy little craft for getting out and back quickly, something on a trailer that can be dropped into the water easily. 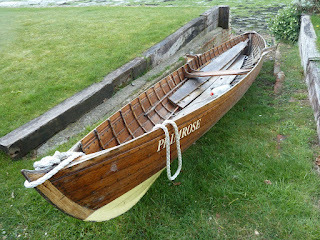 It doesn't have to be a now ubiquitous inflatable RIB, as this elegant little boat shows. 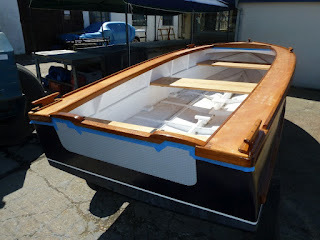 Flaring topsides which should keep the spray down and a hull form which will work at slow speeds as well as fast. 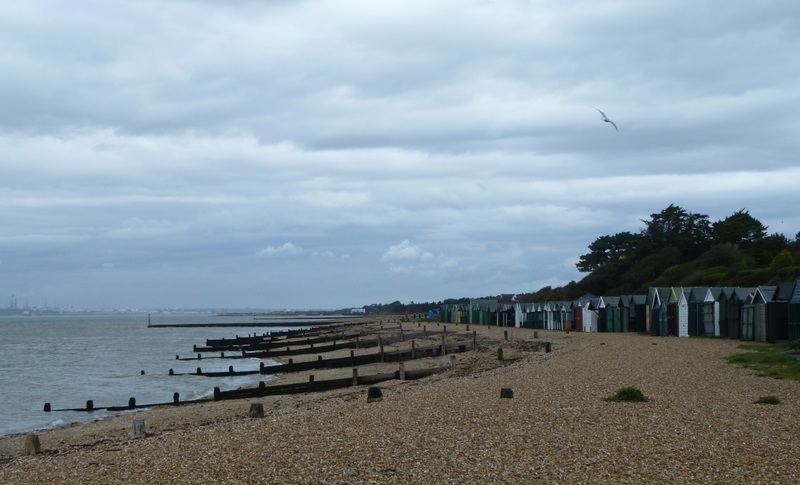 Don't let the recent weekend sunshine fool you this is what the weather has been like most of the time since the start of April, overcast, grey leaden skies when it wasn't actually raining, more rain fell on one day than is average for the entire month. 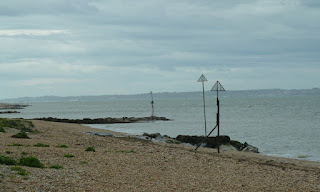 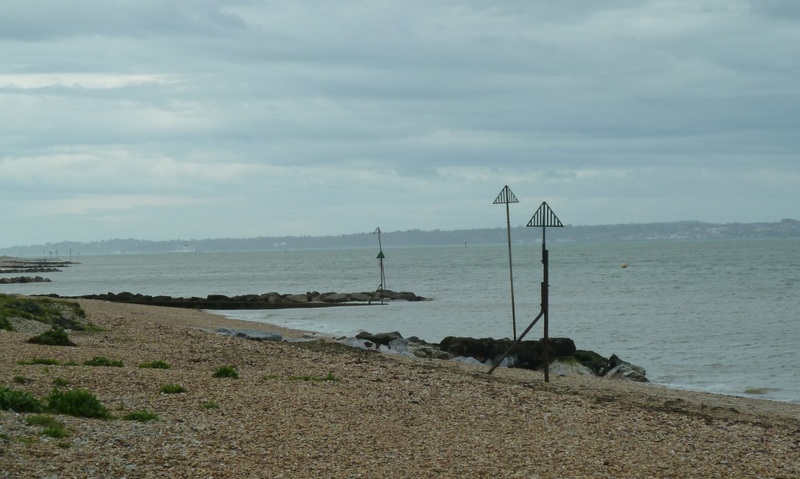 Down at Hill Head the beach was deserted, the beach huts locked up, it might have been a scene from mid winter. 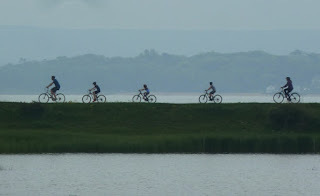 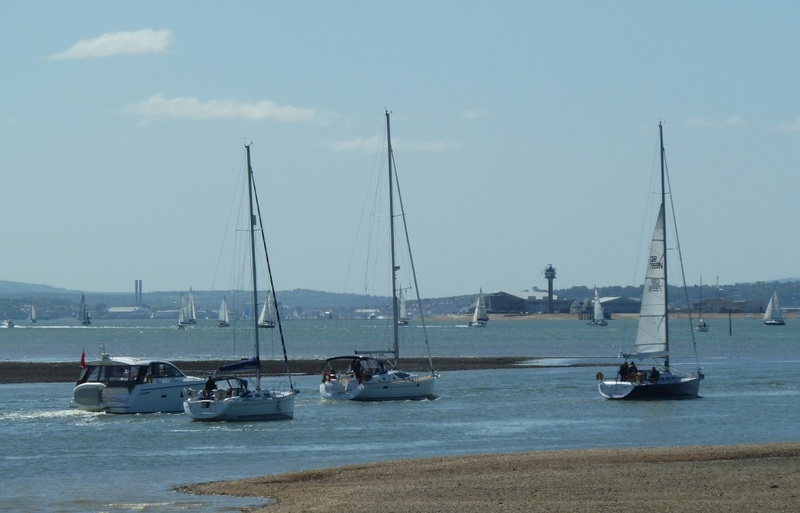 The outlook for the coming weekend isn't great, cloud cover and getting breezy on Sunday with chance of showers, what's happened to those lazy days of summer? 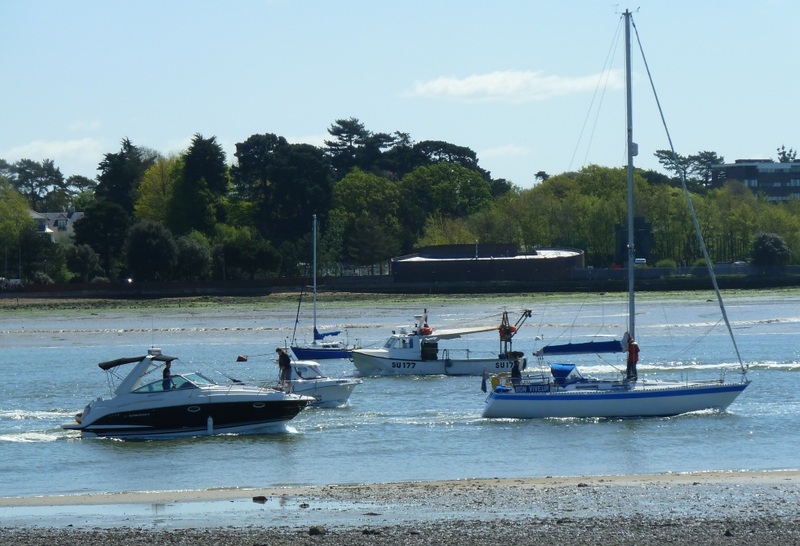 The first sunshine for weeks and weeks brought about a mass boating exodus on Saturday morning, sitting down at Hamble Point it appeared that half the boats on the river were all trying to get out of the river at the same time. 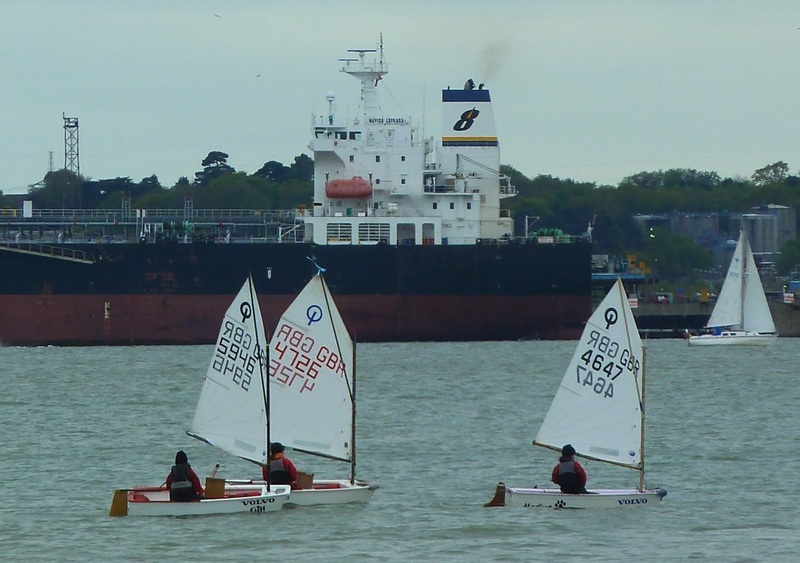 Needless to say there was impatience, boats overtaking in their rush to get out in the open Solent and enjoy the day, kicking up lots of wash, one of the worst aspects of sailing here - the Hamble Scramble. 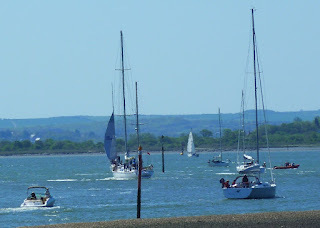 Still it's not not a long way to the quieter waters of the western Solent, the Isle of Wight seen in the background beyond Calshot, sunshine, 15 knots of wind doesn't get much better than that. 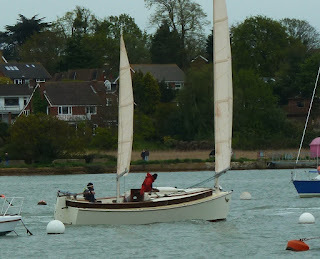 I still haven't managed to get a good photo, or at least one which does justice to this boat, which I believe is a Harrison Butler Yonne class. 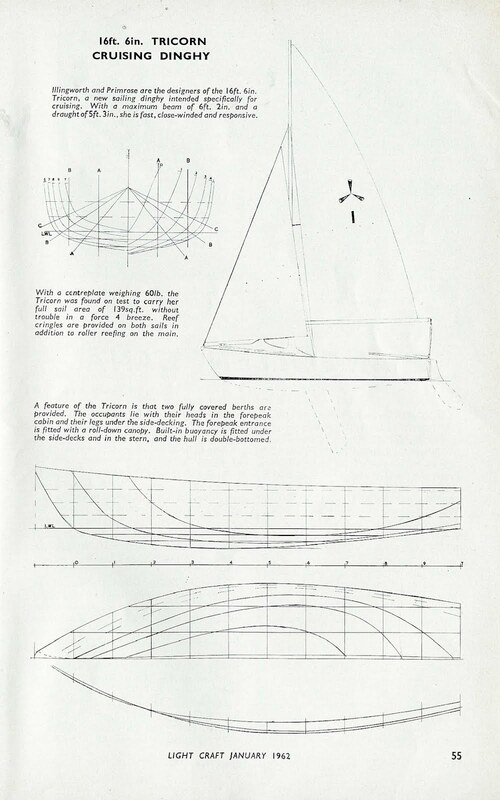 Pages 166/7 of Crusing Yachts Design and Performance, by T Harrison Buter has lines plan and general arrangement of the Yonne design. 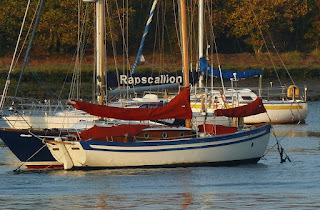 I first noticed her on the river about 10 years ago, when she was painted a in very subtle green, but in recent years she has had this cream and blue livery, which I think is very attractive and shows off the varnished cabin sides perfectly. 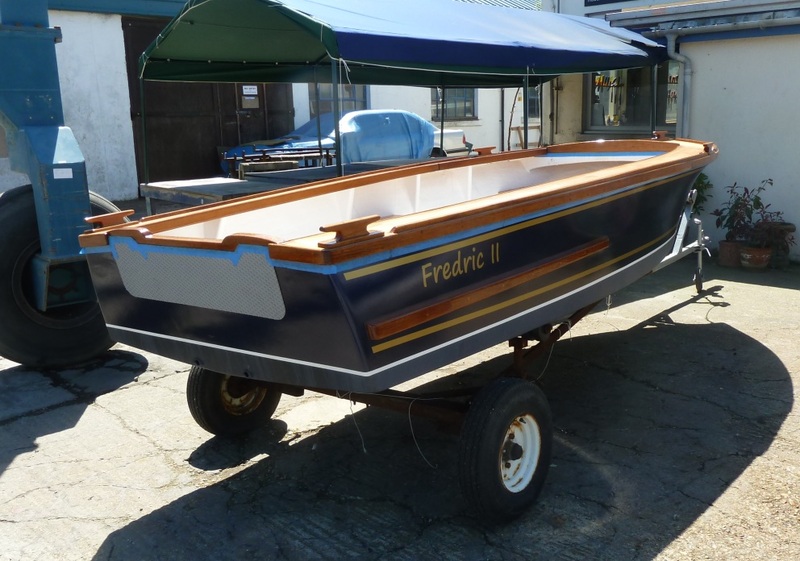 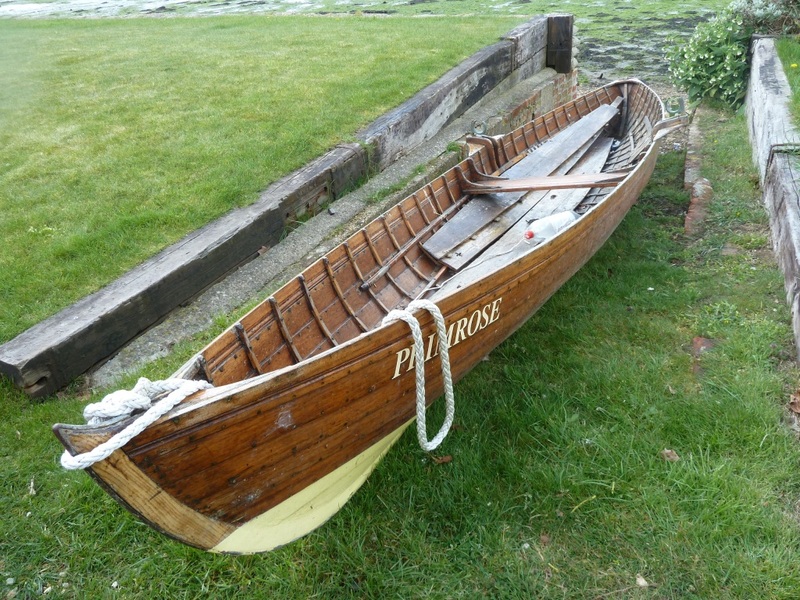 An interesting dinghy from the early 1960's designed and built in response to Ian Proctor's Wayfarer which was proving to be a reliable cruising dinghy. 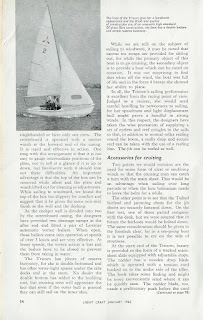 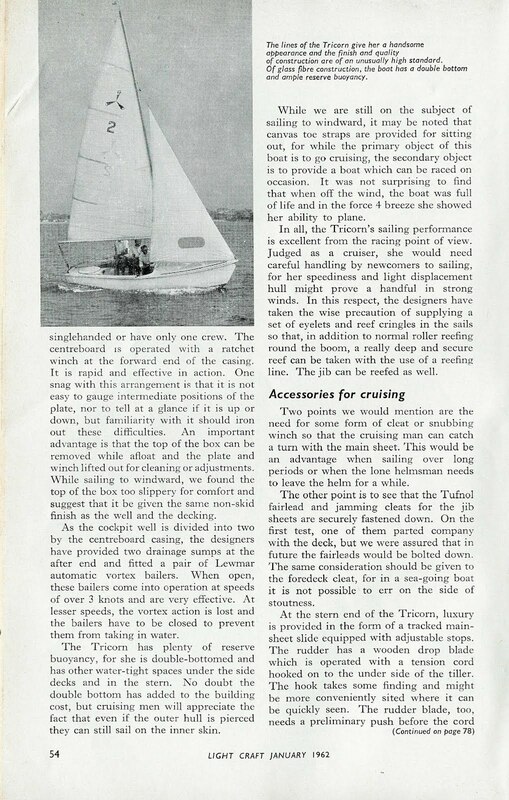 Designed by Illingworth & Primrose and built by Martin Goacher boat builders, the Tricorn featured as a favourable test report in the 1962 Light Craft magazine. 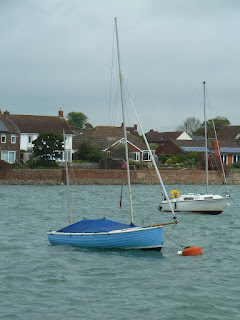 Stability and comfort do not seem to have compromised performance and the small cuddy appears to be a useful feature which blends in well with the overall design. 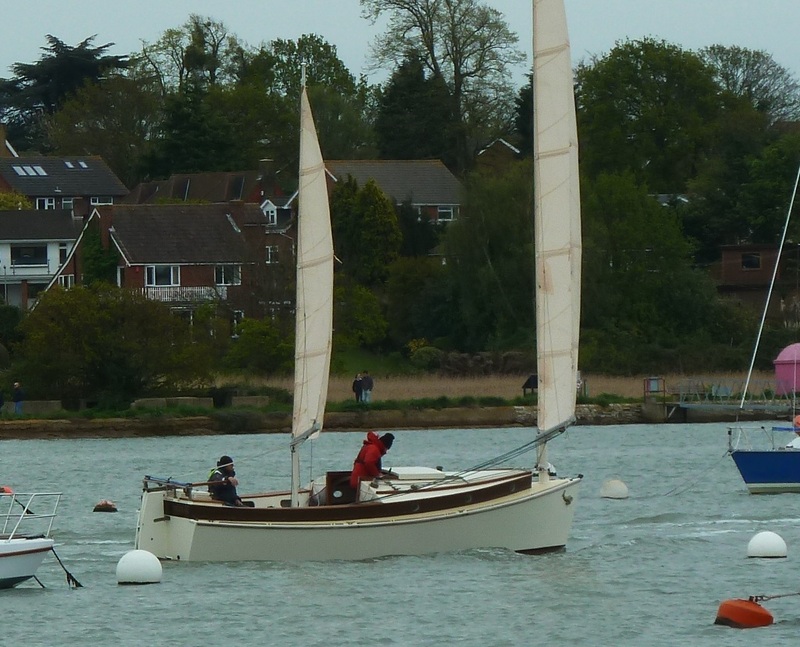 The lines look modern with firm turn at the bilge and a fairly flat run aft. 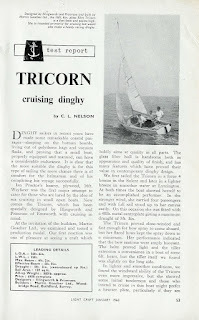 Apart from a few niggles over a few of the construction details the Tricorn looks to have been a capable cruising dinghy. 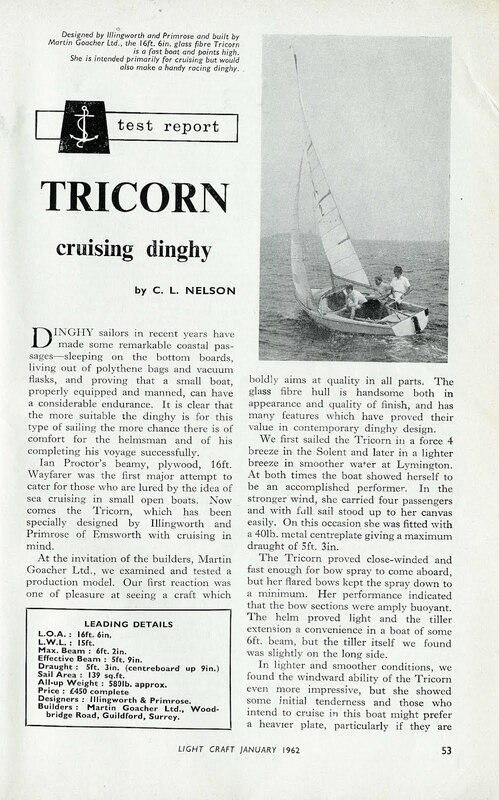 For whatever reason the Tricorn wasn't a commercial success, one turned up on ebay a few years ago, perhaps it was lack of marketing on the part of her builders, maybe the appeal of a cruising dinghy such as this was over estimated, whatever the reason, they are few and far between. Primrose has the look of a Thames skiff, you can just imagine her on a sunny, summer's afternoon gliding gently along under the overhanging willow trees along Cookham reach. 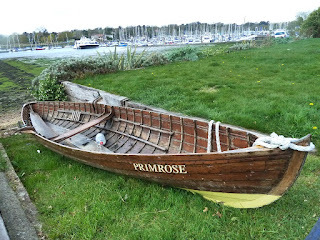 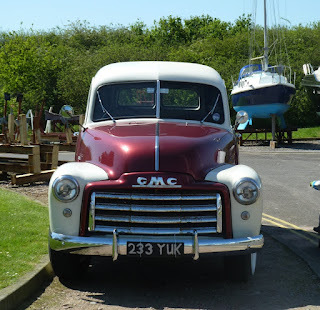 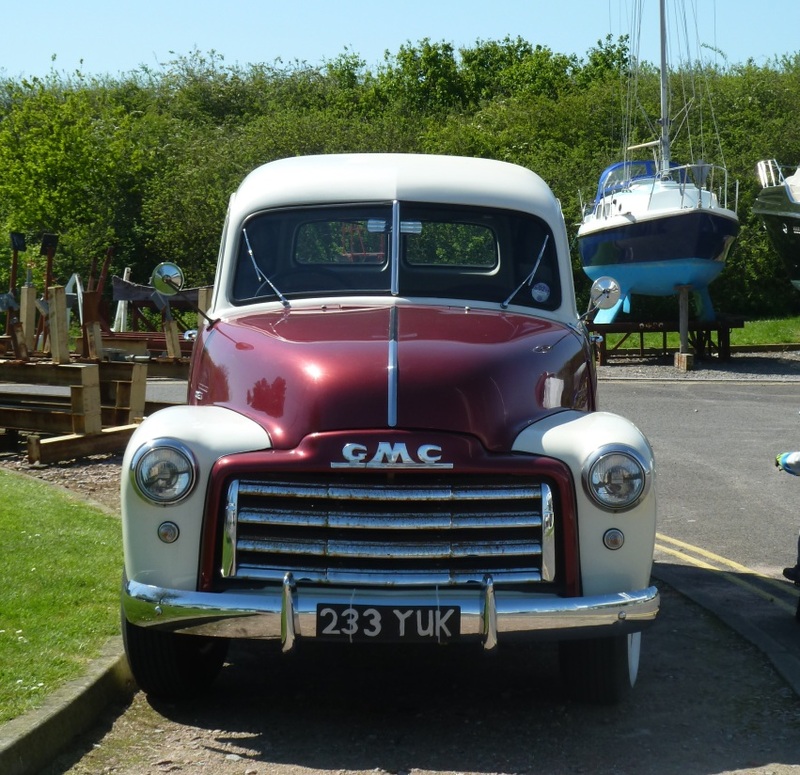 She has been lying behind a hedge on a private foreshore at Swanwick for a year of so uncovered, as a result some of the interior varnish could do with a touch up. A purpose built, wooden boat shed has been under construction recently. Lets hope we see her out on the water this year as well.